That is a great quote; speaking philosophically, one that should encourage us all to sing the song we all have within our souls; if we only have the courage to let it out. Okay, now stepping down off the proverbial soap box; it's time once again to shine a big-bright spot-light on the wine-of-the-week. I know, I have not been a great promoter of Merlot's from California [and for good reason], but between this Merlot from Napa Cellars and one of my other recent wine of weeks reviews, perhaps that idea is turning around a bit for me. Merlot has got a bad rap in recent memory; even though it’s known for creating some of the world’s most sought-after wines. It’s easy to say and has an easy-drinking style; it’s a great blending grape, and known for producing some very age-worthy "collectibles" from places like St.-Émilion, France [need I say more]. Let’s face it, we all know Merlot is one of the "classic" grapes and for many vino-sapiens and even the occasional wandering wino, Washington State's Columbia Valley has been dominating the Merlot market [at least I think so]. But perhaps with two fine examples like the one today from Napa Cellars and the other from Waterstone, perhaps that ship is turning around. Those are two isolated examples; but it's a step in the right direction. This wine is even more affordable than other one I reviewed a week ago, it's a staple of America's largest wine retailer, a wine that can be found at your local neighborhood Costco. It's selling for just a few dollars south of the $22 SRP and will wow you every step of the way, from the first pour to the last drop. In an era of you get what you pay for; this wine in the show-off bottle over-delivers for its price point. This folks is a great value; one you should stock up on, what I would call "every-day" drinker. It's easy on the eyes and on the wallet. In the glass there's a shiny ruby colored core, escaping easily from the glass, notes of dried dark fruits, under brush and a expressive basket of ripe cherries. After the first splash down, a dump-truck full of surprisingly complex flavors of deep red cherry and bright red-vine licorice, tucked in dried tobacco leafs waiting to be rolled and lavender lying on the back porch. The thing you want most from Merlot; a soft mouth-feel [silky tannins], dancing black plum flavors attempt to sink that put on the 9th hole, while dark coffee, bbq smoke and earth give a quiet golf clap, to celebrate this wines great swing. I gave this wine 89 points, well done! 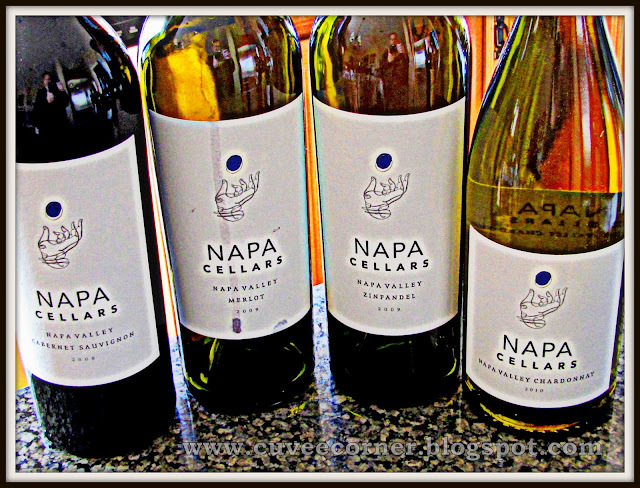 Also in review this week and worthy of mention are the other samples I received from Napa Cellars; the Zinfandel, the Cabernet Sauvignon and their 2010 Chardonnay. 2009 Zinfandel: A racy little number, packed, no I say jammed with pepper and licorice, plus notes of black raspberry, roasted sage and smoke. I found it to be a bit youthful when I opened the bottle a month; though unpolished then, it promises so much in the near future. This wine went great with the North Carolina “pulled” pork sandwiches I made is highly recommended. Score: 87 points. 2008 Cabernet Sauvignon: This wine was a bit tight, a bit too grippy and tad to restrained, like goldilocks, I couldn’t find the one that was just right. What I found in the way of aromas; freshly roasted coffee beans, sage and dried fruit. After I got my first slurp, I found barely ripened black cherries and plums, unsweetened bakers chocolate and a new leather belt; I was none too pleased with this wine. Score: 84 points. 2010 Chardonnay: A classic California Chardonnay; with all the usual players 98% French Oak [35% new] and full Maloactic fermentation and fantastic Carneros fruit. This wine while rich and creamy, still has an elegant side to it. You’ll find that this wine delivers supple, yet fleshy bite of white peach, nectarine and flowery florals, with a creamy vanilla edge. Score: 87 points. Hope you will give these very tasty selections from Napa Cellars a swirl, the next time you're out wine shopping, until next time folks sip long and prosper cheers! Cabernet Round-Up: "Get along little Doggies"